A Collection that’s really Out of This World! Have you ever wondered how much would it cost to collect a coin from every country in Europe? Depending on how you like to travel, you could end up spending many thousands of pounds. At The London Mint Office we are always looking for ways to help our customers save time and money. So we’ve done all the hard work for you to offer you a stunning collection of coins from every corner of the continent. When you order “Coins of the World – Europe” you’ll receive a high quality hard-back presentation folder that opens to reveal a map of Europe and recesses in which to display a coin from each country. You’ll also receive a sealed bag containing forty-eight handpicked coins of different shapes and sizes. Each coin is original and presented in uncirculated quality, which means they will look as bright and shiny as they did when they were first struck. Coin hunters of all ages will enjoy matching each coin with the corresponding pictures on the map until every coin has been placed in its proper home. When you’ve finished you’ll have a coin from every country in Europe displayed in your folder. It can be great fun to see so many different coin designs in one place. Your collection will include beautiful images of fish, horses, plants, animals, monuments, buildings, ships and people. Find out which country has a dolphin on its currency, or an image of Saint George and the Dragon. You’ll be able to embark upon a voyage of discovery without ever leaving the house. What’s more, for a limited time only, we have an extra little gift for you. 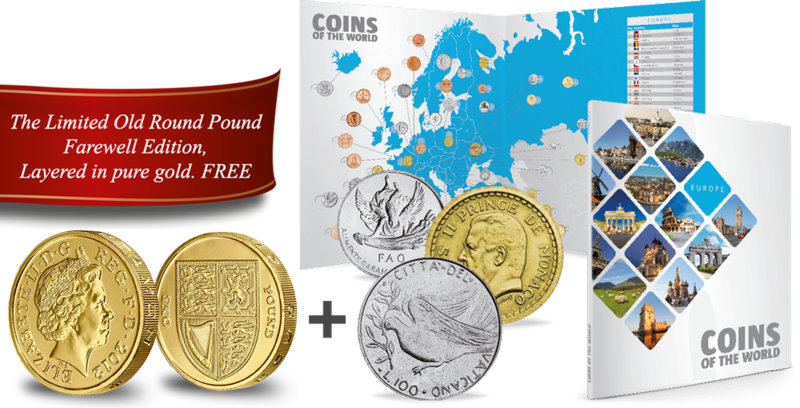 With your “Coins of the World – Europe” collection, you will also receive a FREE gold layered old round pound coin! As European currencies from your set continue to disappear in favour of the Euro, we also say farewell to our old round pound coin, phased out to welcome in the new 12-sided coin. This gold layered round pound will serve as a fantastic keepsake to show future generations the coin that helped to build British society. “Coins of the World – Europe” makes a perfect gift for Christmas that will be treasured for many years to come.